These vegan, gluten-free, Chewy Hemp-Nut Granola Bars are sticky and sweet, salty and textured, with big chunks of raw cashews and fine grains of toasty hemp seeds, flax and rolled oats. This bar-baking sesh was inspired by one of my fave celebrities too..
Why? Well, In real life, everyday cooking is fun. And casual. And the joy is finding how to embed cooking into your daily life in a way that makes you feel inspired, proud and happy. And also, totally ready to fail, make mistakes and learn your way through a recipe. The truth is guys, even when you have the PERFECT recipe, you can absolutely still make mistakes. I know this because it has happened to me on both ends. Anyone who says that their recipes always turn out perfectly, is probably Martha Stewart... Actually no, I am SURE that even Martha has flubs and #fails. Food Perfection. "Food content" online has evolved quite rapidly from the casual and fun of ten years ago, to the perfect and Instagram-able. The basic truth that "pretty food" is more appealing, has turned a bit extreme. Avocado roses, galaxy donuts, edible flowers on everything. I agree that you eat with your eyes and food presentation is important. But only to a certain point of comfort. I can only imagine how intimidating some food content can feel to the average at-home cook. My advice is pretty basic: Make it "pretty" enough for yourself. Don't worry about how your food turns out for Instagram. Back in 'the day' (ten years or so ago) blogs became crazy-popular, because of one main reason: at-home cooks helped make recipes look accessible. I hope I can still do that for you guys, even in the changed online food climate where everyone has upped their game in terms of photos, presentation and overall beauty. Gorgeous, inspiring food is GOOD. But balancing things out with accessibility - especially for plant-based recipes, which are often times NEW to cooks, is so important. So moral of the story!.. I love the whole 'pretend cooking show' premise that Jennifer started. I love how it embraces the fact that the BEST recipes end up being the ones that, over time, you learn to just "whip up" with ease and create with familiarity. so much familiarity, that you can tweak things here and there, when desired. Today's Recipe is a Fave. 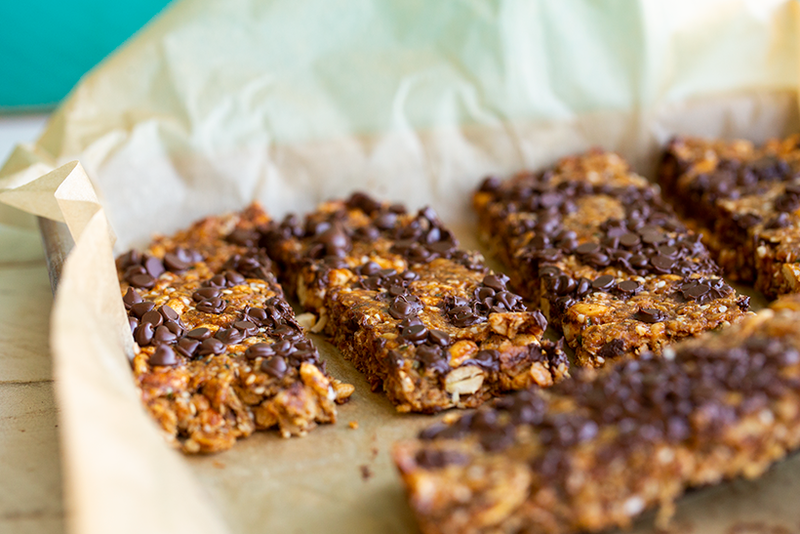 These granola bars are another spin on my fave granola bars. I have been making spins on granola bars for many years now. Thank you Jennifer for reminding me to make them! So Jennifer Garner inspired this recipe, I love how she started everything off in a small sauce pot. She loads the dry ingredients in a large bowl, but I actually just kept everything in the sauce pot - and it worked beautifully. 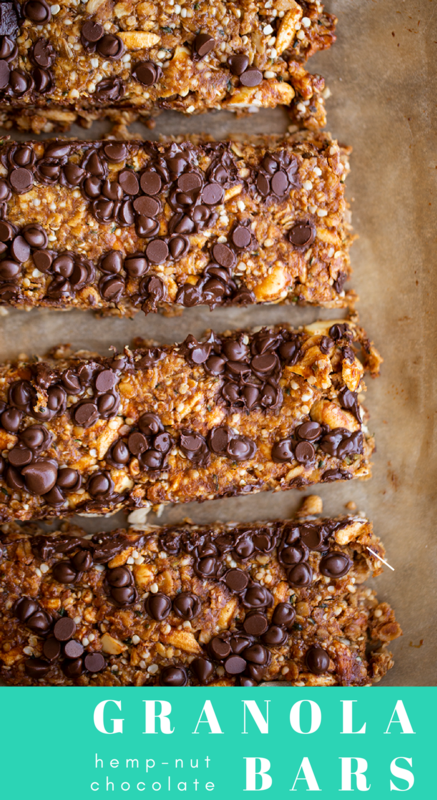 One pot granola bars! Oh, and if you love the pretend cooking show thing, browse JG's page for more videos. I love the bagel video too. Now I want to make bagels! 1. One Inch Baking Sheet. Use a baking pan with one inch edges. I like this half-sheet pan, with those one inch edges. I use it for a lot of dishes. I like the small, sturdy size. You could also use a brownie dish or whatever you have on hand, really, but the one inch size helps me keep the thickness of my bars even. 2. Parchment Paper. I always use parchment paper with my granola bars. I load the mixture onto about half of the sheet. Then I fold over the paper for the other half and press down to flatten the bars smoothly. 3. Tweak Ingredients. 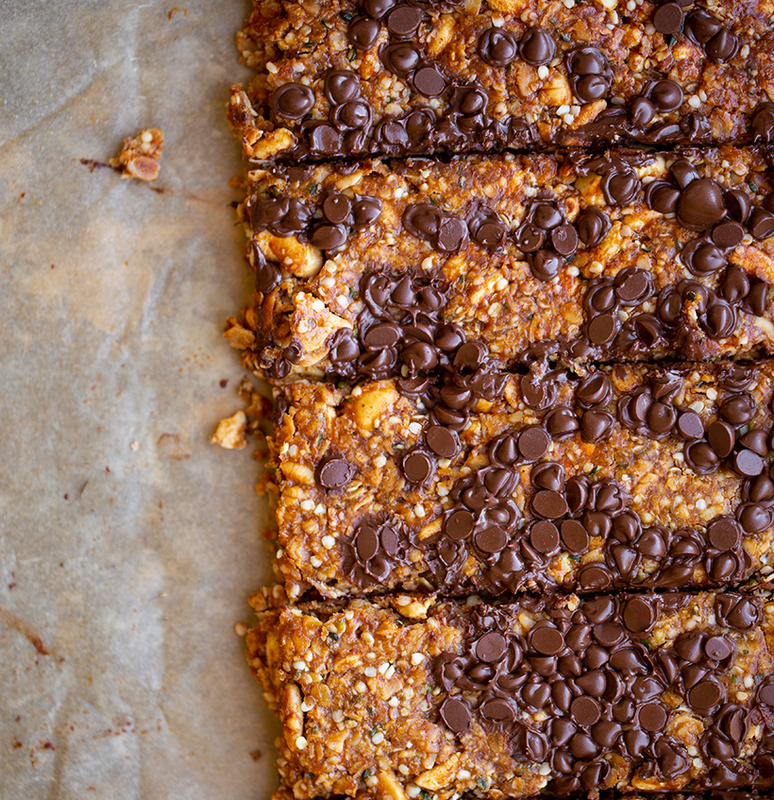 You can absolutely play with ingredients for granola bars. The wet ingredients should usually stay about the same for an overall amount, but the dry ingredients can be subbed to your liking. Hate cashews? Try pecans. Don't want peanut butter? Try aother nut or seed butter. The sweetener in these bars is super easy to change up. Sub with maple, coconut sugar or even honey, if need be. 4. Bake Them. I actually love raw granola bars. But I really love baked granola bars! I find that the flavors intensify and they travel a bit better when they are baked. 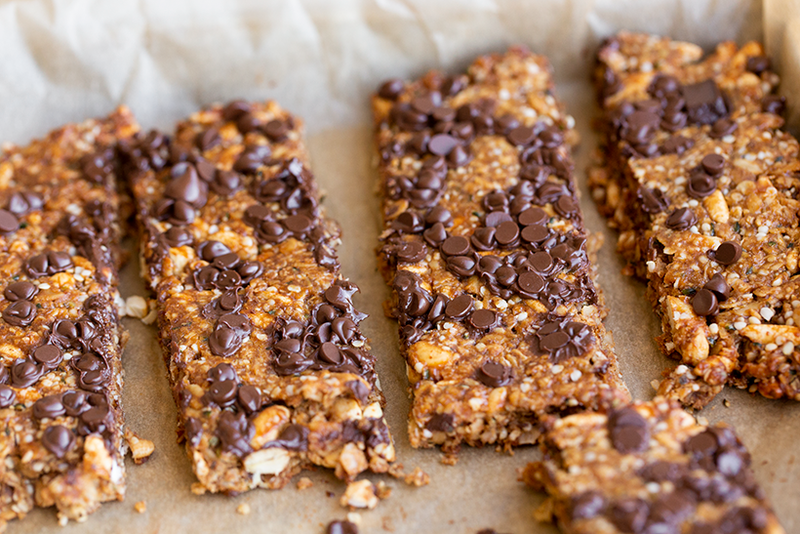 Make raw bars when desired, but try them baked at least once and see what you think. 5. Chocolate. Chocolate is optional. But a little bit goes a long way in adding yummy, indulgent flavor. I simply sprinkle a few mini chocolate chips over top the bars right after I pull them from the over. Then I press them into the bars using the parchment. They melt and squish right into the top. 6. Bind Them. 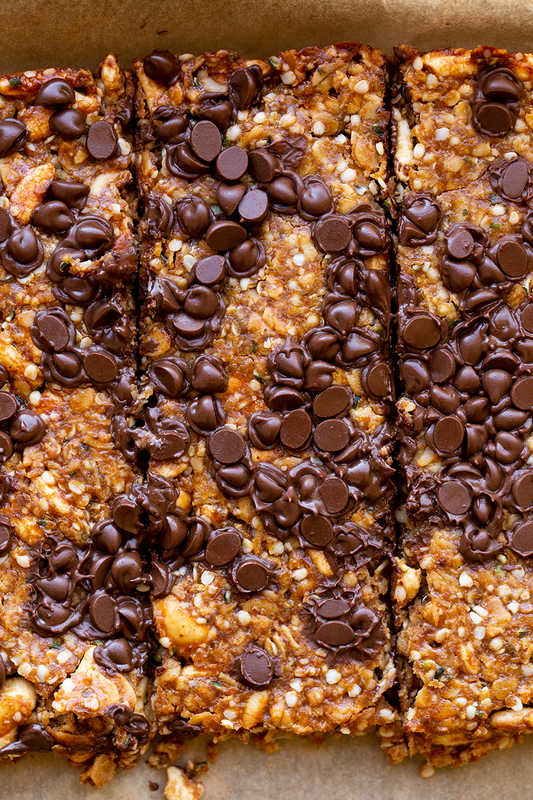 You really want to make sure you have some binding ingredients in your bars. something sticky that will bring things together. In raw bars, coconut oil actually works very well when chilled! 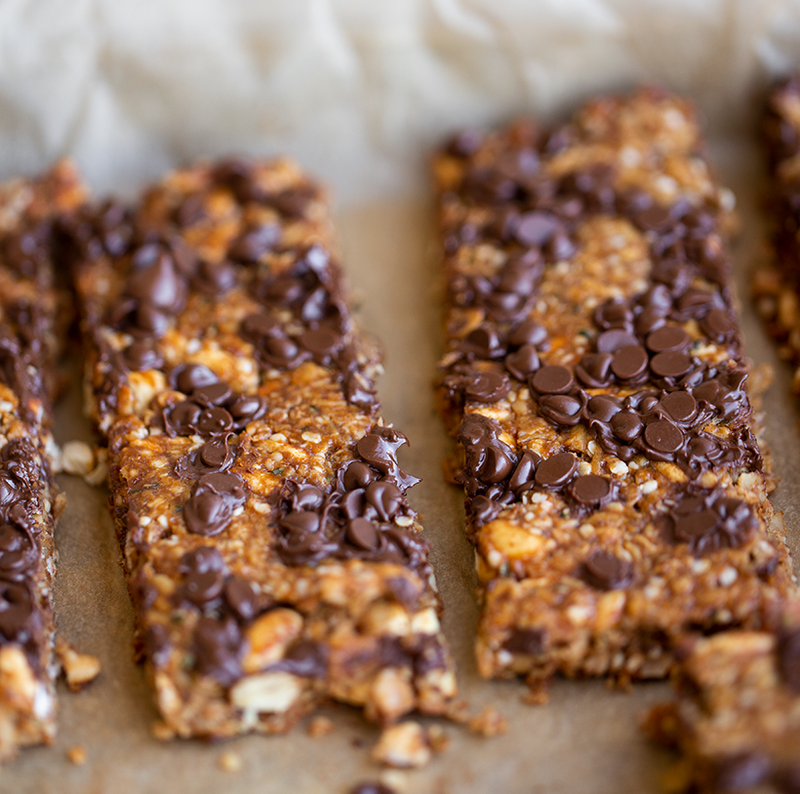 For these bars, the nut butter, sweetener and flax seed all act as binder. 7. Have Fun! 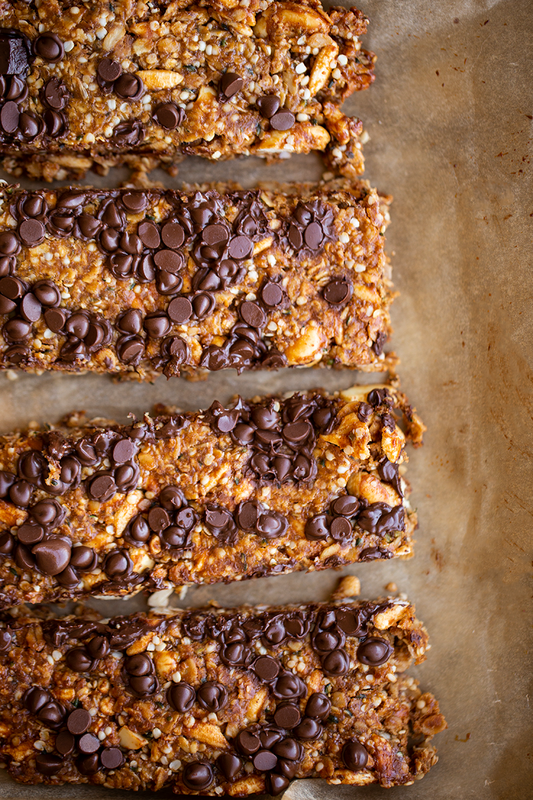 Granola bars are total kid food. So feel free to get quirky with your bars. Add in some chopped pretzels. Or vegan colored candies. Or even mini marshmallows! Or add in some other super foods like chopped dates, soaked goji berries, chia seeds and more. Have fun in the kitchen and you will want to cook things more often! 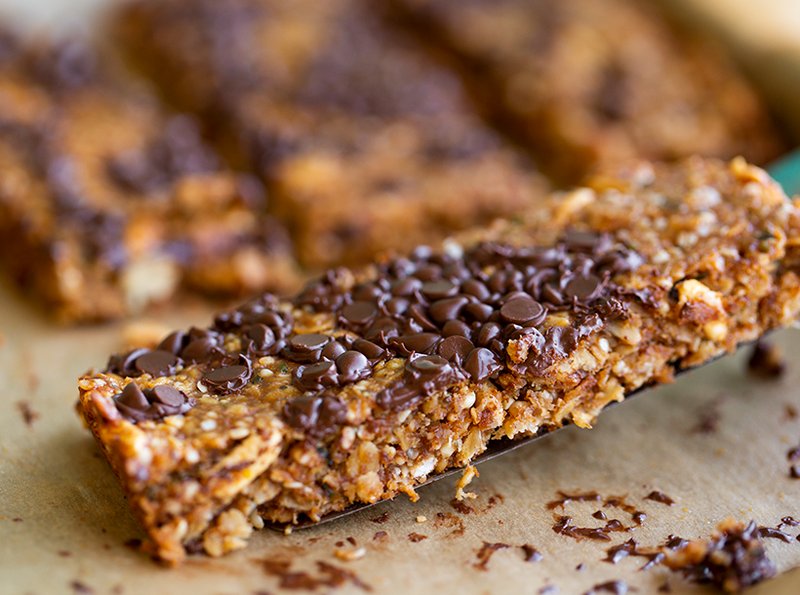 These vegan, gluten-free granola bars are rich in flavor, texture, fiber and nutrients. 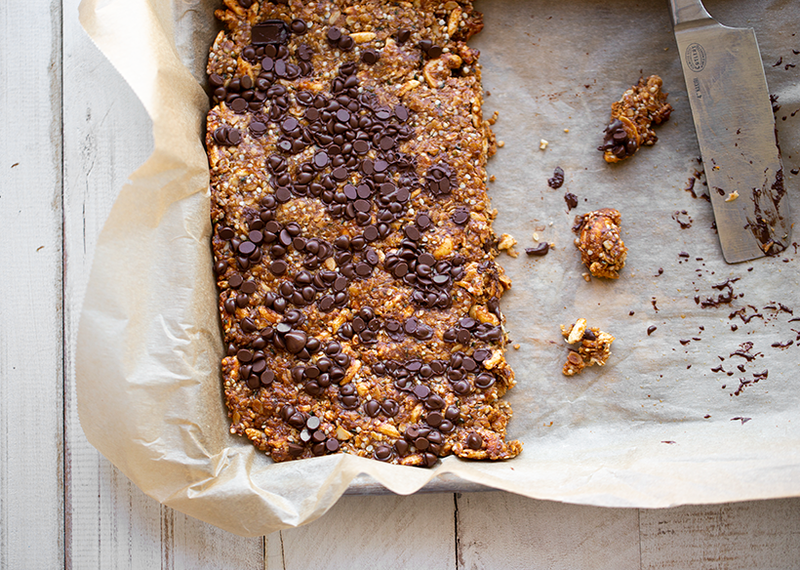 Packed with nuts, oats and even hemps seeds - these healthy bars will fuel your day, deliciously! In a small sauce pot, over medium heat, add the vegan butter and peanut butter. Stir until softened. Turn heat to low. Then add in the agave syrup. Stir for a minute, until well combined. Add in the hemp seeds, salt, vanilla, cinnamon, cashews, flax seed, coconut flakes. Turn off the heat. Stir well to combine. The mixture will feel quite thick and sticky at this point. Lastly, fold in the puffed rice. Lay a sheet of parchment paper down on a one-inch thick baking sheet. Pour the mixture onto one side of the sheet and flatten and spread with a spoon. Use the other half of the parchment paper (folded over) to press down and evenly flatten the bars. The bars should take up about half of the total (half sheet) baking sheet. Bars should be about 3/4 inch thick. Load bars into the 350 degree oven and bake for 15 minutes. Edges will begin to brown when the bars are done. Pull the bars from the oven and sprinkle the optional chocolate chips over top. Then, fold the parchment back over and gently press the chocolate into the baked bars. They should melt and smash into the top of the bars quite effortlessly. Cool bars at least ten minutes before slicing and serving. Store leftovers in the fridge.